Communities that earn an Honorable Mention are recognized for a year. These communities are recognized for starting efforts to address the need of bicyclists in their community. 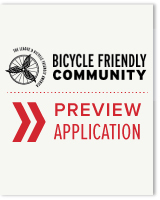 They often have popular shared use paths, community-wide bicycling events, or recent bicycle planning processes. Over 100 communities that originally earned an Honorable Mention have gone on to be awarded a Bronze designation or better. If you would like to see communities that earned a Bronze designation or higher, please see our interactive Award Database or download the complete list of BFCs.